Don’t you just love letterpress? I’ve always thought it was beautiful but with todays quick and convenient digital and printing technology my love of letterpress has grown even stronger. It’s like a lost art form. You can’t rush it, you can’t share it on social media, you can’t illegally download it or Pin it. It’s something you can feel and best of all, it impresses the crap outta people. I was super excited to come across Graven Feather, a relatively young functioning studio for artists, as well as a workshop, retail, and gallery space. I basically called them up and invited myself over to come and check out their space. Graven Feather is Pam & Erin, two lovely artists with a passion for bringing their illustrations to life with various forms of printing. Pam and Erin were great and I really enjoyed spending some time chatting with them and checking out all their fun printing toys. The studio/gallery is really a place for artists to create and share and one of my favourite ways to that is through workshops. 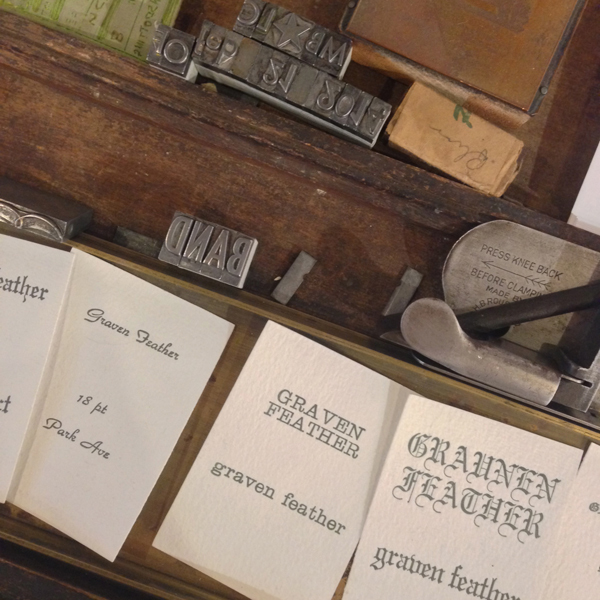 Graven Feather offer a variety of great paper and print themed workshops including letterpress, linocut, silk-screen, book binding, paper cutting and even framing. 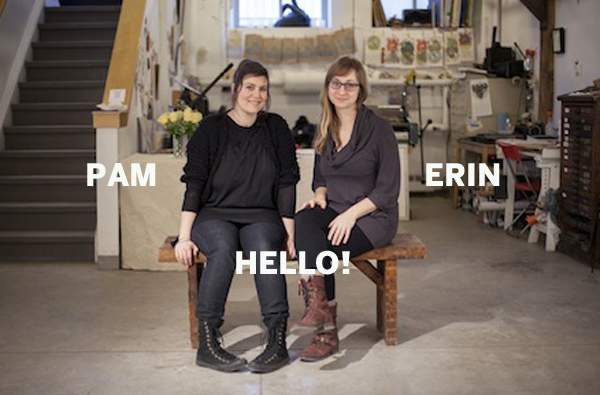 Keep reading to find out more about Pam and Erin and your chance to win a spot at one of their upcoming letterpress workshops. How awesome would that be?! I love snooping around people’s studio. A messy studio is a creative studio. 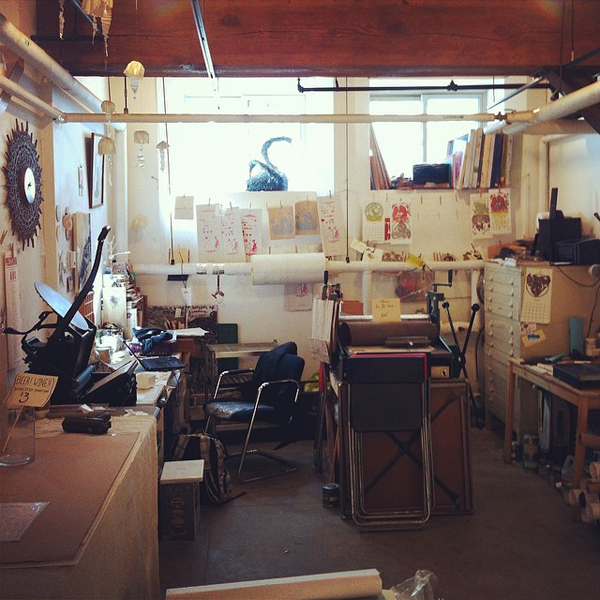 There’s something wrong if a studio space is perfectly tidy. Graven Feather has 3 different sized letterpresses, one big linotype press and a huge collection of full font sets of all sizes. The graphic designer in me totally geeks out when I’m around this stuff. I thought I would have a little Q&A with Pam & Erin and get a little more insight into them and the studio that you won’t find on the website. 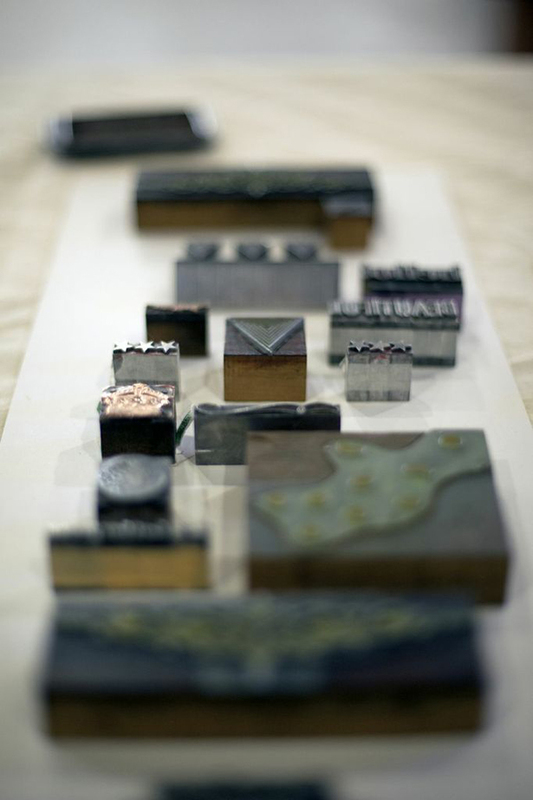 The love story: When did you first fall in love with letterpress? ERIN: I think the first time I heard about letterpress was in high school, while learning about the Gutenberg Bible and the revolution caused by the distribution of written material to the masses . It was the sight of those gorgeous twisty, curved cast-iron presses that intrigued me, especially the art-deco ones. And I didn’t understand how it all worked, how one got a newspaper out of a mechanical beast like that. I remember pulling the crank on an old tabletop press in Barkerville (a historic site in BC), it was such a glee-filled experience. I had no idea I’d ever have a studio filled with them. PAM: The best part of letterpress is always pulling the first print. Seeing your design come together after the tedious process of hand setting the type is so satisfying. A close second would be mixing the inks. My least favourite is returning each of the letters back into the case. 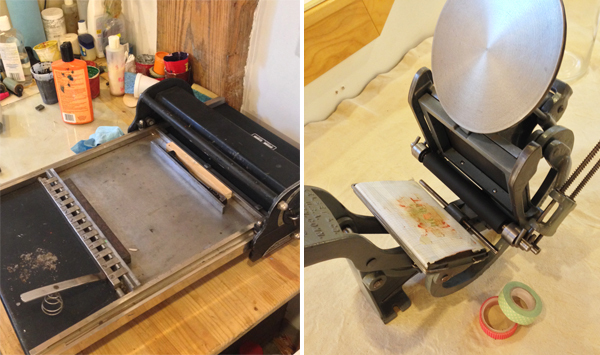 What would be your dream letterpress project? PAM: My dream project is to start printing limited editions of prints on our large Challenge Proof Press with artists from our community and beyond. I hope to see this happen later this year. ERIN: I think my latest dream letterpress project is to print a small folio of poems. About a year ago, a friend introduced me to some incredible poetry, and I suffered a kind of poetic fever. I started trolling the internet like crazy, staying up late, trying to find more and more of the kind I liked. I’d never felt anything about poetry before and this was like finding a new kind of music….Letterpress is an amazing way to honour words and word-play because it turns text into a three-dimensional object. With the right kind of paper and pressure, you can literally feel each letter with your fingertips. PAM: Graven Feather to me is a Fluid artspace for experimentation and learning. ERIN: Graven Feather in five words…ooh, that’s a tough challenge. It’s so many things all at once. 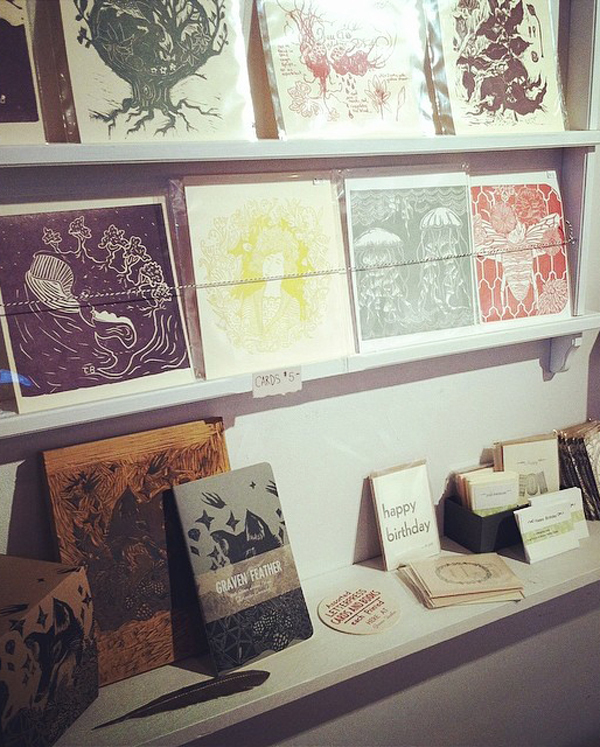 … art, letterpress, handcrafted, printed goods, fun, and unique. Hmm..that’s seven words. ha. oh well. I think that describes it. 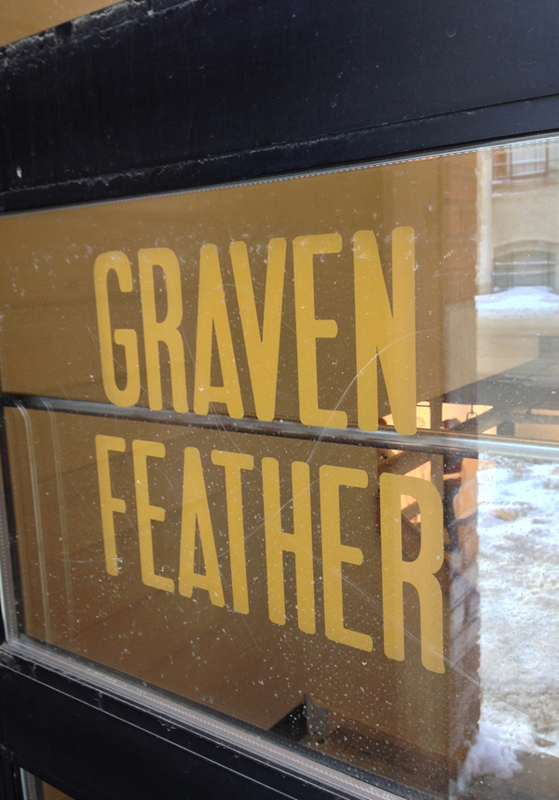 You can stay in the loop with what’s happening at Graven Feather by following them on Twitter, tumblr or Facebook. 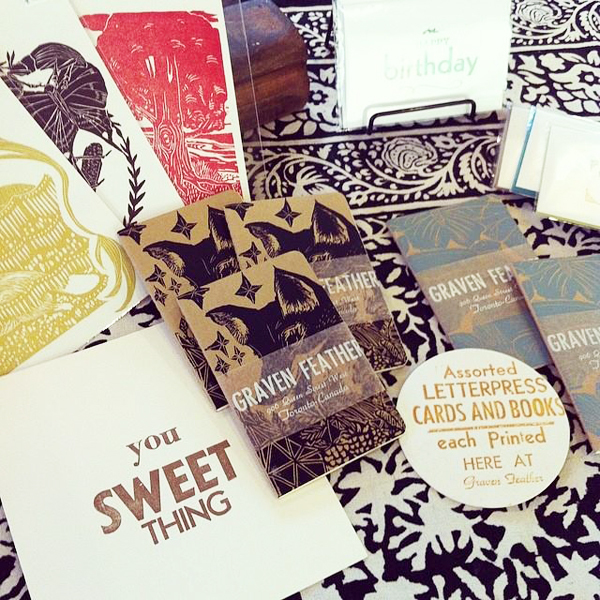 In fact following them can help you win a spot one of their upcoming letterpress workshops! Aren’t you just itching to get your hands dirty now and actually create your own prints? See below on how to enter. 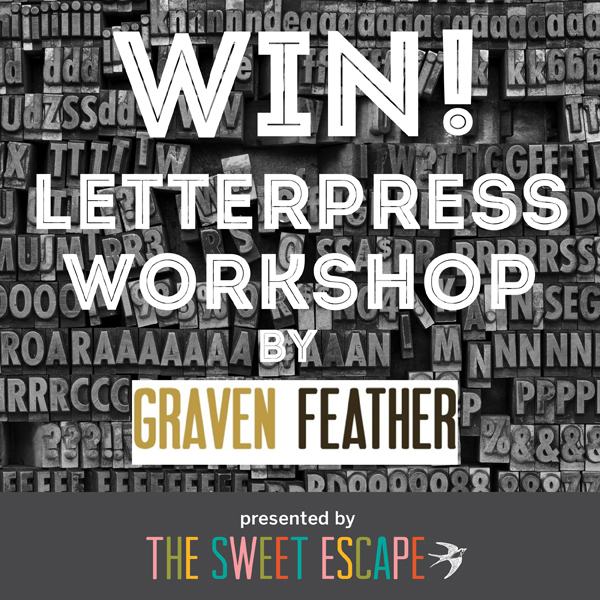 And if you don’t happen to be a winner you can catch a FREE print demo by Graven Feather tomorrow, March 26th at The Japanese Paper Place, 1-7pm. * this contest is closed. Letterpress is one art form I’ve had almost no exposure to. That studio looks amazing, and I’d love to try a workshop. And if you’re asking about my fav piece from the One of a Kind Show, it’s always the pottery! I love a great and inspiring quote, that would definitely be what I make. Happy Birthday week! What a great giveaway. I’m a huge fan of custom invitations & I’ve always wanted to try my hand at letterpress. Some of the one of a kind letterpress artwork I’ve seen is amazing! Neat – Letterpress is something that I’ve always been interested in, but never figured I’ve ever have the chance to give it a try. Graven Feather’s other workshops look neat too – I may have to look into them! Letterpress has been on my “to-do” list for far too long!! I’ve always wanted to try it. I especially love paper goods (like cards and invites) and tote bags!! 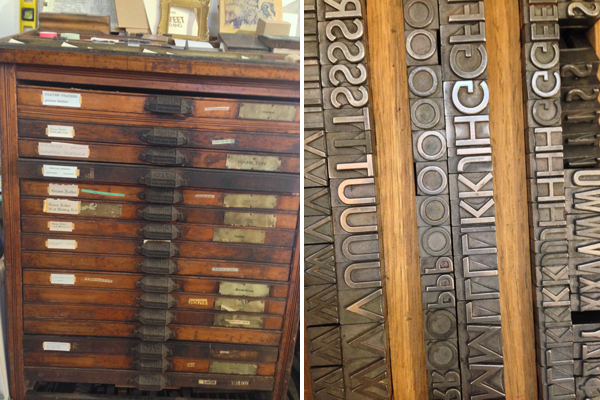 I love letterpress typography – definitely make something with type. I’m a complete fan of letterpress. After having visited another Letterpress in B.C (Clawhammer) I’m hooked. Thanks for the chance to enter. I’ve also ‘pinned’ one of your fabulous pics from Gravenfeather. I would love to try a workshop. My daughter just finished classes with Erin at Articulations and loved it. I would make some art! Love this! As a designer I love the tactile experience of letterpress & how it brings the art to life. Had my wedding invites letter pressed and it’s still one of my favourite elements of the day. I would love to make a cool typography type of print. Oooh I love this giveaway so much!! Very interested in learning how people can “whip” up letterpress. Seems like a very daunting, but creative, task! Thanks for hosting the giveaway for your readers. Seems like a fun one! I keep sending my grandmother cards other people have made, she keeps asking me when I’m gonna send her one I made myself. I’d love to send her a letterpressed beauty. 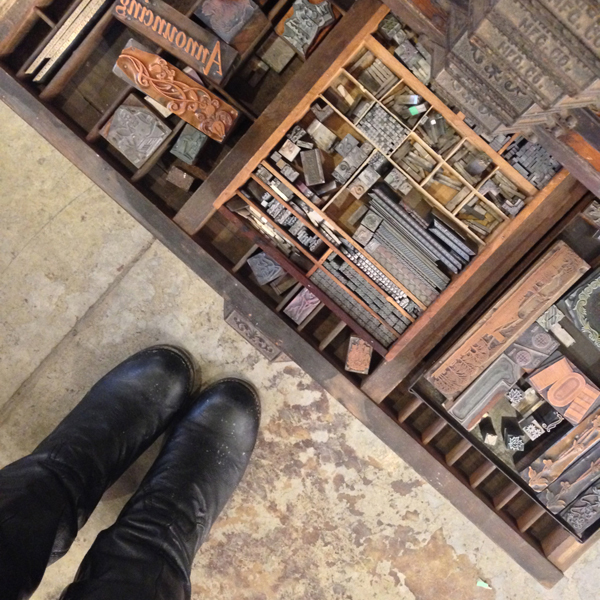 I would love to win the letterpress workshop! I’d make a packet of bright and cheery coloured stationary to send a little spring to those desperately in need and not getting it from Mother Nature! I think, may be baby name or inspirational quote.